Home About What is an earmould? People who wear a behind-the-ear (BTE) hearing aid also wear an earmould inside their ear. 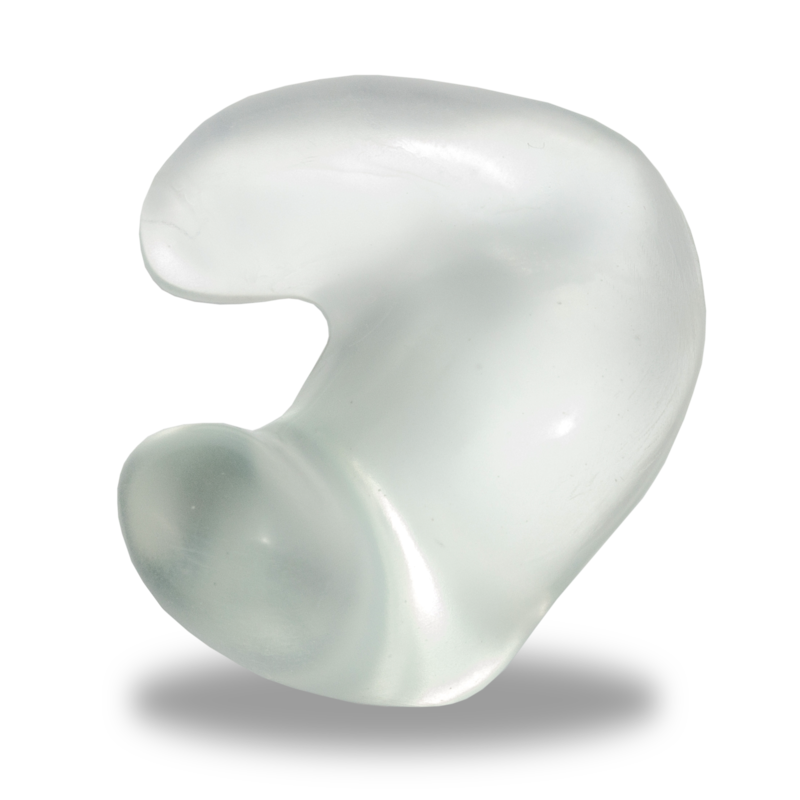 An earmould is a piece of material, usually silicone or acrylic, that’s moulded to fit the exact shape of the ear. It’s an essential part of a BTE hearing aid as the design will greatly affect the wearer’s comfort. This is because the sound that a hearing aid reproduces is influenced by the shape of the earmould. The main purpose of an earmould is to conduct sound from a BTE hearing aid into the ear. It also helps ensure that the hearing aid rests securely on the ear. A well-fitting earmould will prevent sound leakage, which can cause a BTE hearing aid to whistle. To make an earmould an accurate impression must be taken of the ear by a qualified hearing care professional. The first step is to carefully inspect the ear canal using a medical device known as an otoscope. This is done to make sure the ear canal is in the right condition for an impression to be taken. A build-up of earwax, skin flakes, irritation of the ear canal, abnormal cavities in the ear canal or an abnormal ear canal can all make it difficult to take an ear impression. Once the ear has been inspected, the impression can be taken. First an otoblock will be inserted into the ear canal. This prevents the impression material from coming too close to the eardrum. Next the soft, silicone-based impression material is injected into the ear with a syringe. Impression material is a mixture of two substances that react to each other and make the impression harden. During this process the ears can feel like they’re blocked, but it’s a totally harmless process. While the impression material hardens, it’s a good idea for the person having their impressions taken to open and close their mouth or make chewing movements. Once the impression material hardens, the impression is carefully removed from the ear and checked for irregularities, dents, unfilled gaps, and air holes. Then the finished impression is sent to us to be made into an earmould. Choosing the right earmould product to meet your patients’ needs is essential to achieving the optimal hearing aid fitting. Earmoulds are made from a variety of different chemical compounds which dictate their properties of hardness, clarity, toxicity, water absorption, tensile strength, density, elasticity and colours. The choice of earmould style is wide and varied. The degree of hearing loss, together with a number of other equally important factors including age, dexterity, cosmetics and modification requirements, all need to be taken into consideration as part of the selection process. A hole is drilled in the mould that will pave the way to your ear canal. A vent can also be made in the mould to improve sound quality. While vents can be a huge help with sound quality, they can also contribute to avoiding “occlusion” problems, which can make the sound of the wearer’s own voice seem hollow or booming. Tubing is mounted on the hook of the hearing aid to help direct sound from the hearing aid to the inner ear. It’s important that the earmould’s tube to the hearing aid is of the correct length and is clean, unbroken and soft. If the tube is too short, the wearer may feel an uncomfortable pull on the earmould. If it’s too long, it will be difficult to keep the hearing aid in place behind the ear. To insert an earmould, turn off the hearing aid or turn the volume down. The broad curve of the earmould should be towards the back of the head, and the elbow of the earmould should point upwards. The earmould should be inserted into the ear from behind at a slanting angle. It may be helpful to gently pull the outer ear backwards and upwards so that the ear canal widens and slightly straightens. Earmoulds slip easily into place in some people’s ears, while in others they must be gently “rocked” into place. When removing the earmould from the ear, the hearing aid should be turned off or turned down before the earmould is gently pulled out of the ear. To ensure your earmould is kept in tip top condition make sure you take regular care of it.